If you didn’t figure it out by the changing color of Brandon’s shirts in my Harry Potter post, we spent multiple days at Universal Studios. 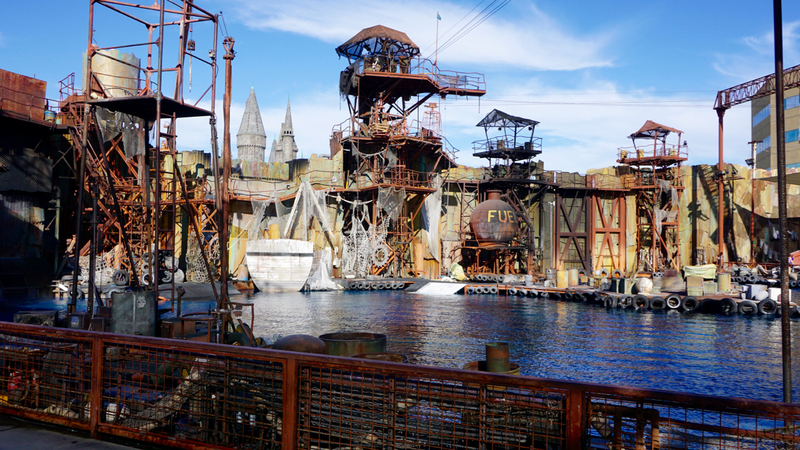 Our favorite stops from day one (The Wizarding World of Harry Potter, Springfield, and the Waterworld Show) got a second visit on day two. 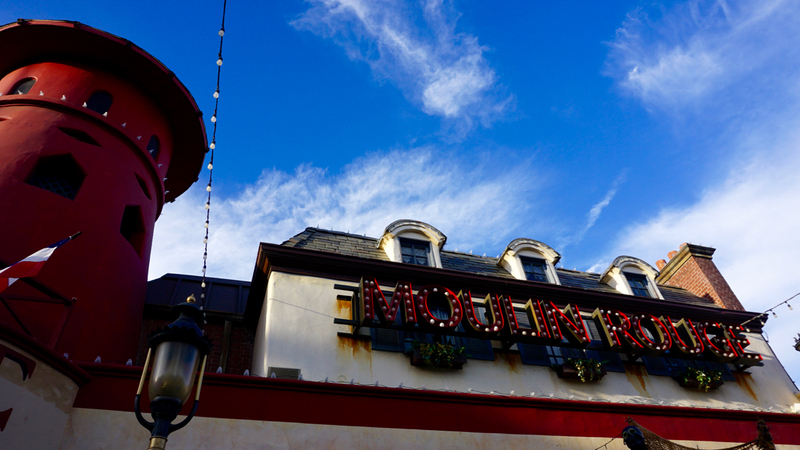 The first day was sunny and hot, particularly for late October. After spending all morning running around (me in a hot, black wizard’s robe) we were ready for a cool down. The perfect solution was to sit in the front row (i.e., the splash zone) at the Waterworld show. I had never seen the movie before (we’ve since corrected that) but the live show was amazing nonetheless. Waterworld was a postapocalyptic movie starring Kevin Costner that came out in 1995. It depicted a world covered entirely in ocean after the complete melting of the polar icecaps. The survivors live on boats or ramshackle man-made atolls, all searching for the mythical “dry land”. The set was incredible but the actors and special effects really made the show. When the explosions went off you could really feel the heat. And they catapulted an entire float plane right over the set wall. Seriously. They catapulted it. We looked and couldn’t find any wires holding up the plane. 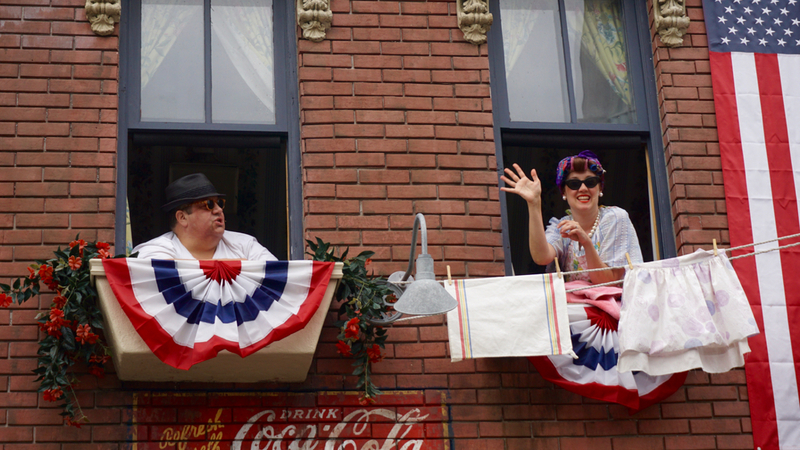 All of the actors were also actors on current television shows with Universal Studios. We’re pretty out of touch with current TV shows and didn’t recognize any of them. You can see the towers of the Hogwarts Castle over the set wall in this photo. The first time we watched the show we didn’t take any pictures because we were in the splash zone and didn’t want the camera to get wet. For what it’s worth, they really mean it when they say you will get wet watching this show. We were totally soaked from the very beginning, partially because a cast member came over and dumped a bucket of water on top of us to make an example. The second time we sat far away from the splash zone so we could take photos. Unfortunately, the cast was having one problem after the other. First, they had to stop the show for technical difficulties when one of the jet skis malfunctioned and started sinking. Next, they had to stop the show completely after the lead actor was inadvertently hit in the head with an aluminum hammer during a fight scene. Such is the nature of live theater. When I planned this trip to Universal Studios I didn’t look into anything that wasn’t Harry Potter related. I honestly had no idea what else was inside the park when we arrived. 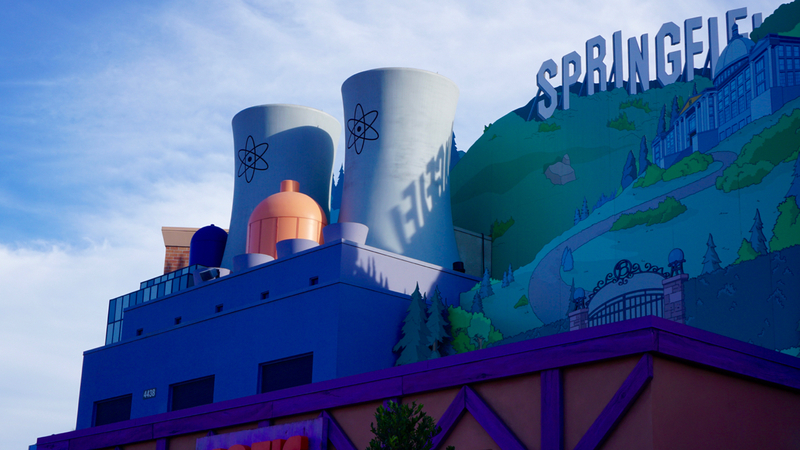 Consequently, it was a huge amazing surprise to turn the corner and see the colorful ridiculousness of Springfield. 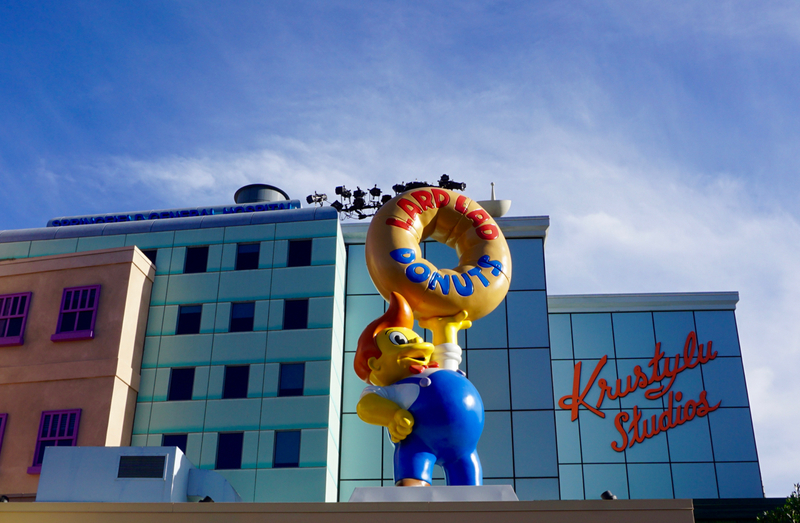 You could get a real-life Lard Lad donut! 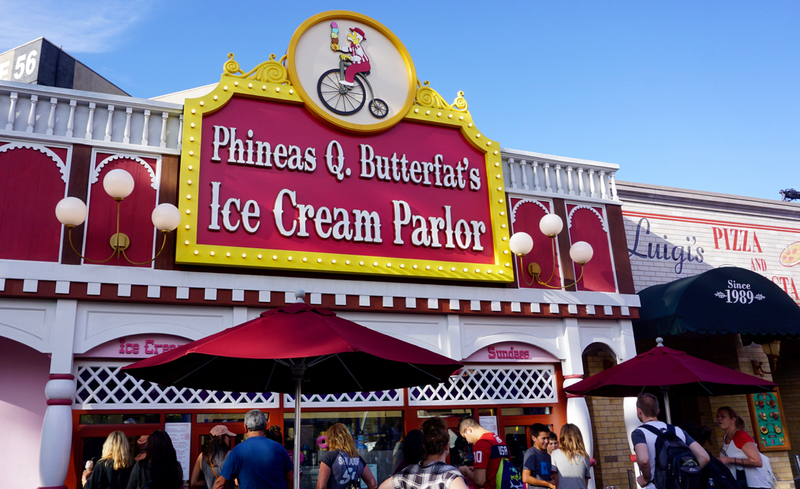 Or a chocolate cone at Phineas Q. Butterfat’s Ice Cream Parlor! Or some tacos at Bumblebee Man’s Taco Truck! Actually, a lot of Springfield was focused on food. You could also eat fried chicken at Cletus’ Chicken Shack (where the chicken almost crossed the road) or grab a hot dog at Suds McDuff’s Hot Dogs (home of the Ralph Wiggum Choo-Choo Churro). I would challenge you to find a meal that isn’t a sugar-loaded fried carb-bomb, but where’s the fun in that? We went for the Krusty Burgers, which were actually really good. 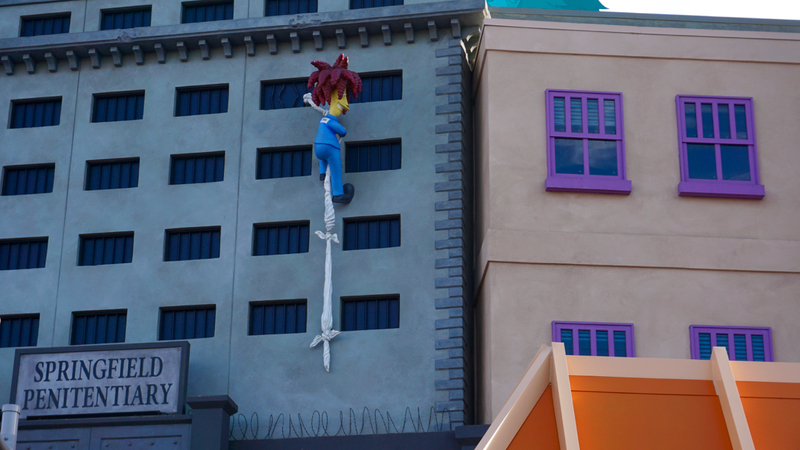 Overall, we were totally surprised by the food quality at Universal Studios. 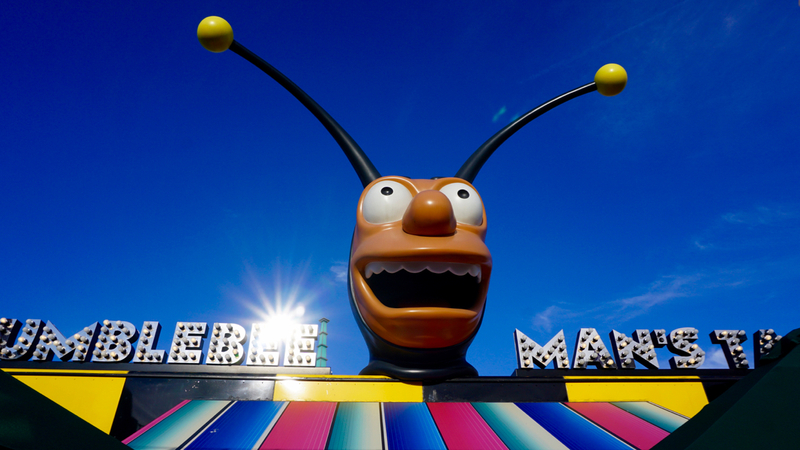 We both remember the theme parks from our childhood only serving carnival food. Hot dogs, chili dogs, frito-pie, nachos, pizza, funnel cake, popcorn, cotton candy, maybe chicken on a stick (if you were lucky). 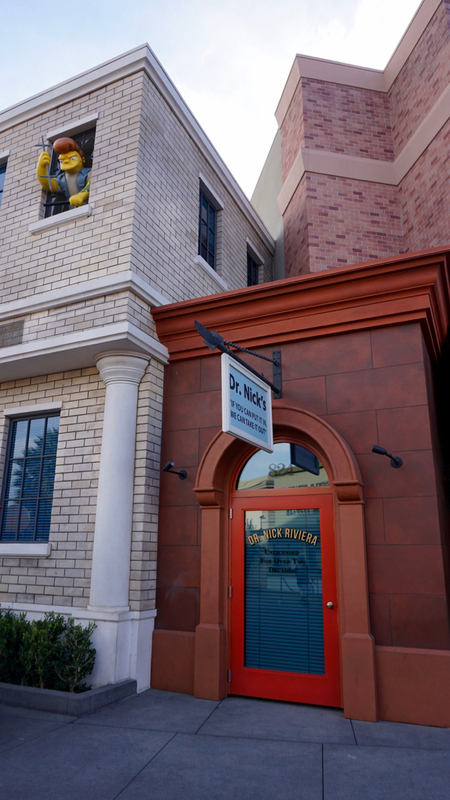 The choices at Universal were extensive and if you looked (beyond Springfield) you could even find healthier options. 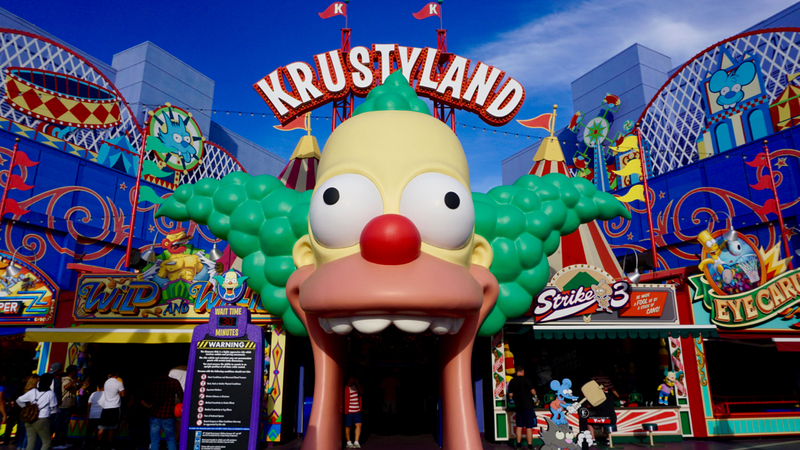 Krustyland had a bunch of carnival games and the Krusty the Clown roller coaster. I’m not sure why, but we didn’t play the games or ride the coaster. We stopped by the Kwik-E-Mart, which amazingly did not sell squishies, but I did get to hang with Bart and Lisa. Bart swears he is not responsible for the trash can graffiti. Lisa thinks he’s being childish. We ran into Chief Wiggum and checked out the Duff Brewery, which is mostly just another restaurant that serves Duff Beer. The park says that Duff Beer is brewed by a local brewery specifically for the park, but it tastes suspiciously similar to Coors Banquet. Later, we went by Moe’s Tavern to have a Duff with Barney and try out the Love Tester Machine. Something we learned about Universal is that you can spend an entire day here and not even realize there are two other sections in the park. The Wizarding World of Harry Potter, Springfield, the Waterworld Show, and most of the restaurants and shopping are in the upper section near the entrance. 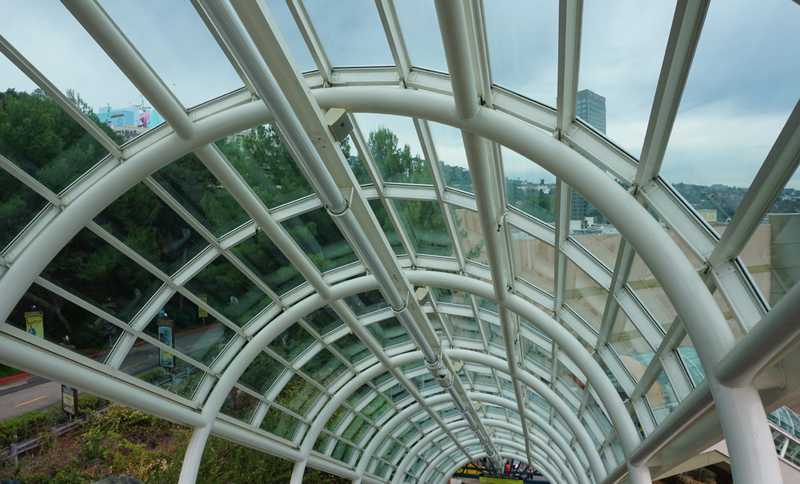 But if you go down the giant escalators at the back you can get to two lower sections. One section has the Jurassic Park ride (my favorite), the Transformers ride (probably better if you’ve seen the movies), and the Mummy ride (short but exciting). 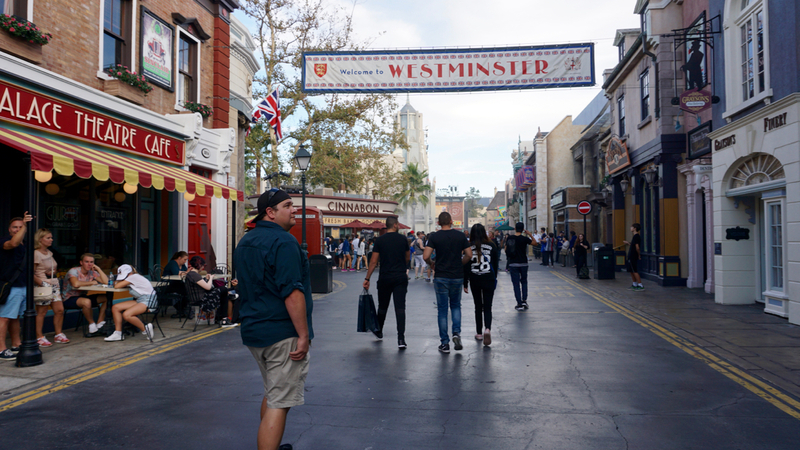 The second section is the Universal Studio tour, which takes you through the working side of Universal, through the lot full of sound stages and the back lot of full size outdoor sets. The place is enormous. 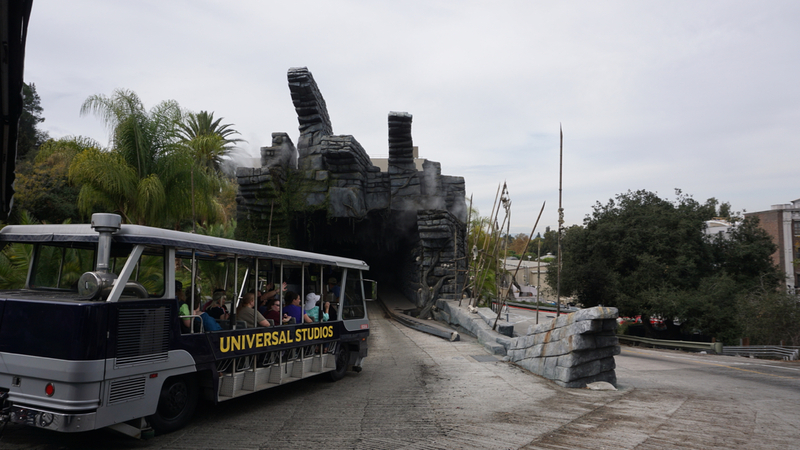 Of the three roller coasters in the lower section, the Jurassic Park ride was the my favorite. It felt like they hadn’t changed a thing since they built it in the late 90s. 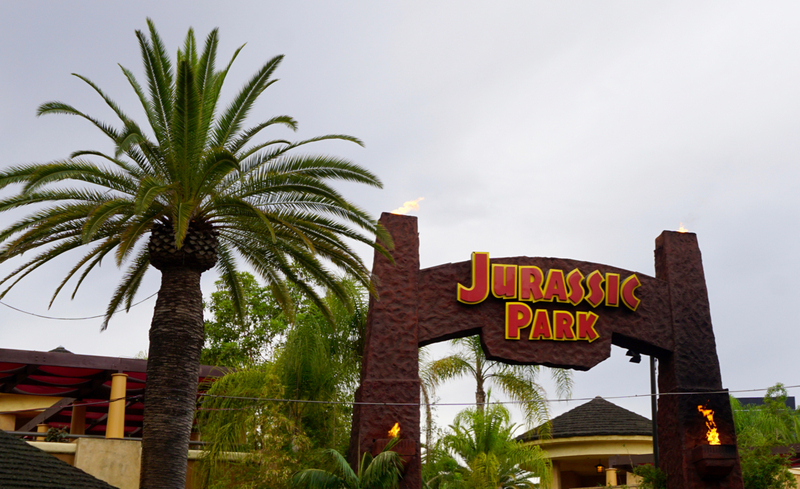 It is a classic log ride through a river of animatronic dinosaurs that suddenly goes wrong when the carnivores escape. Like the Waterworld show, it was the perfect cool down in the middle of the afternoon. The Studio tour took about an hour but was totally worth the time. It was fun to see behind the scenes and impressive to realize how much can be hidden or changed by the right camera angle. All of the sets looked much smaller and less realistic than they do in the movies. 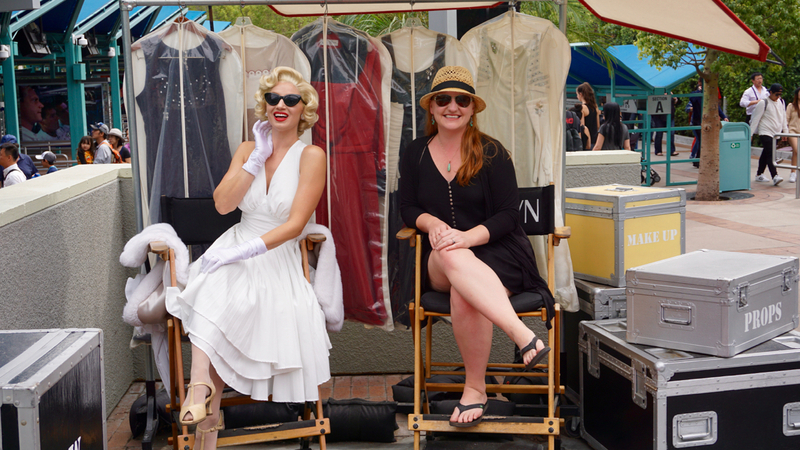 Marilyn picked up a Russian accent along the way. What made the tour interesting was seeing how many sets from classic movies were still intact and still being used for other movies. They just change the signs, add some paint, and voila! It looks like a completely different place in the movie. 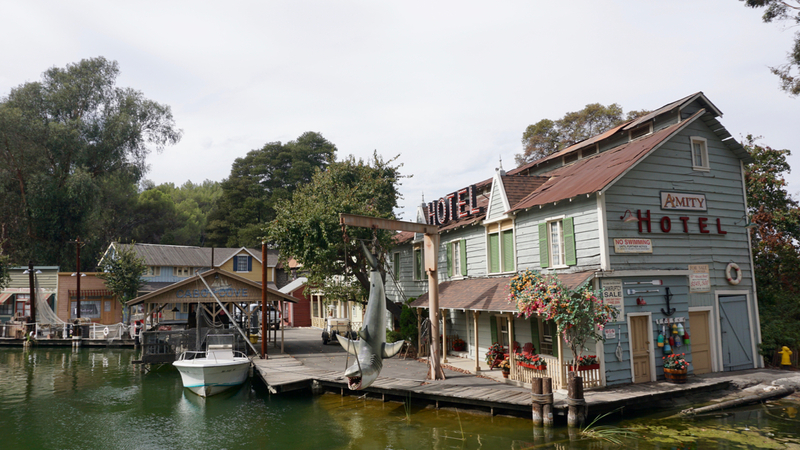 We also drove by the Universal Lagoon, a pond that has been on-screen as the entire ocean (using miniature boats) and was also the pond where Norman Bates hid the body in Psycho. I don’t remember the guide mentioning whether the Jaws set below had been used for other movies. 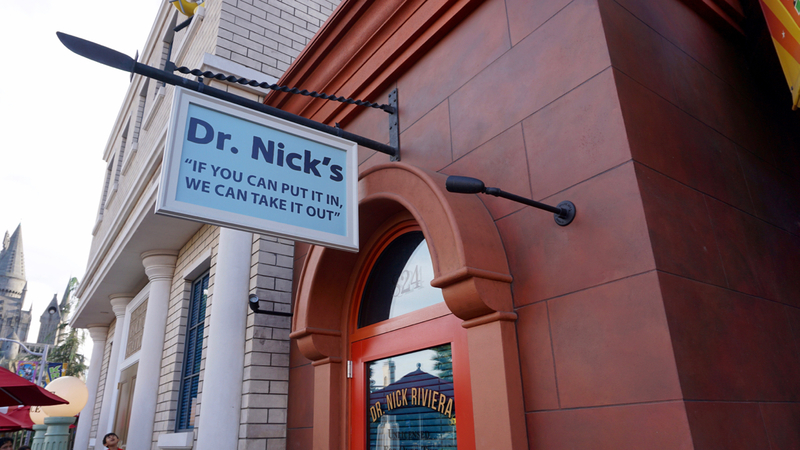 It’s only use now may just be as a fun stop for the studio tour. The tram stops just in time to see a diver get attacked by the giant shark and blow up a couple of gas tanks. 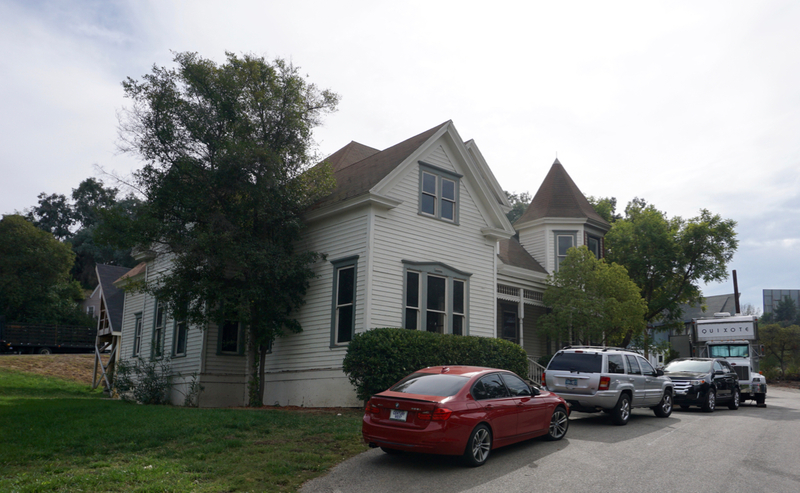 The Best Little Whore House in Texas doesn’t look nearly as fun without Burt and Dolly. 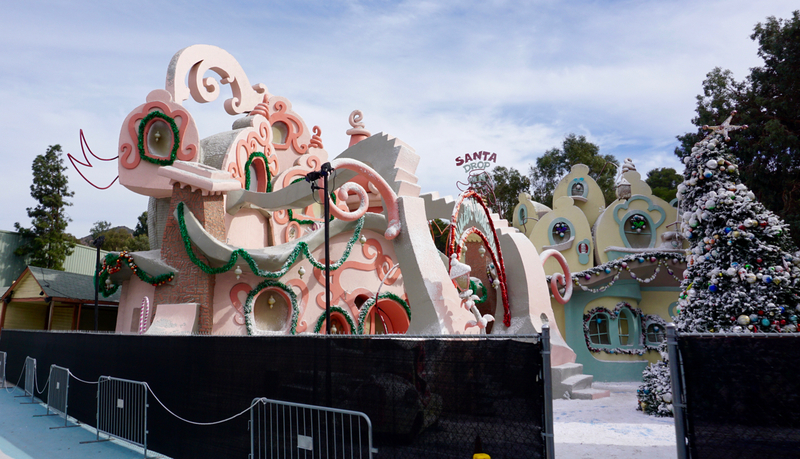 And Whoville doesn’t look nearly as festive backed up to the Bates Motel. 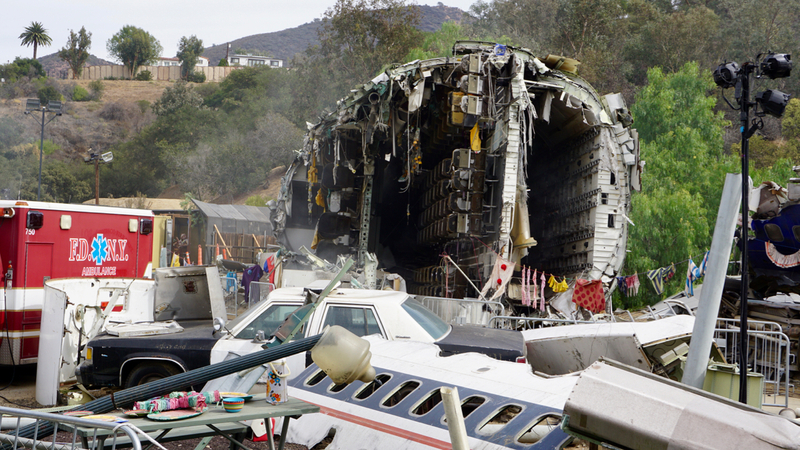 This very real and very destroyed plane was brought in for a scene in War of the Worlds. It cost so much money to have the plane pieces delivered and placed on the lot that the studio decide to just leave them there. The plane appeared for less than 5 minutes in the final cut. There are a couple of “rides” during the studio tour, but you don’t even have to leave your seat. 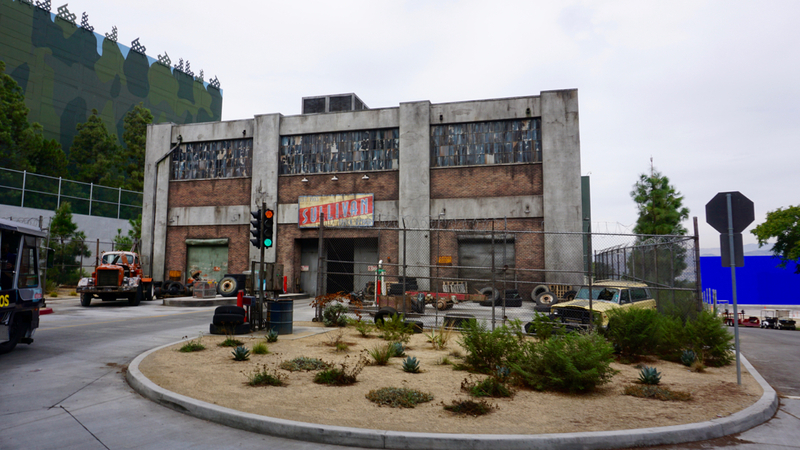 The tram drives into a warehouse sized studio and they use special effects to set the scene. The first was a 3D battle between a T-Rex and King Kong. It was very cool to have 3D screens on either side because it made you feel as if you were in the middle of the action. The second ride demonstrated how they can mimic the major destruction of being in a subway tunnel during an earthquake. The tram shook, the lights flickered, a full size bus fell through the ceiling, and a water main broke, flooding the tunnel. It was seriously impressive. It also shocked me how much money and time they put into building sets that will only be shown for a few minutes on TV. This set had recently been built for one scene in a TV show. Now they were just using it as part of the tour. The final ride of the tour was supposed to be the inside of the Fast and The Furious garage. Unfortunately, the ride was down for technically difficulties, so I have no idea what actually happens. Neither of us are big fans of that movie franchise so we weren’t terribly disappointed. Also, they gave us a free front of the line pass to make up for it. Some of these sets have been around for years. They just keep altering and reusing them. The western set has been in use since the 1950s. They call the colorful village set “Little Europe” because they can alter it to represent nearly any European country from any modern era. 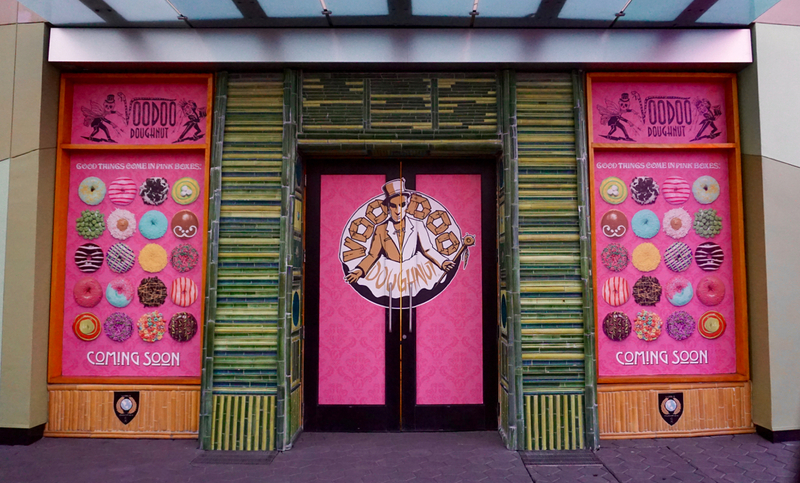 And the city set has been a stand in for New York City numerous times but was also the streets of London during the Austin Powers intro dance scene. Back in the upper section of the park, we wandered through another “Little Europe”. This area is mostly just restaurants, bars, and coffee shops, but was fun to wander. 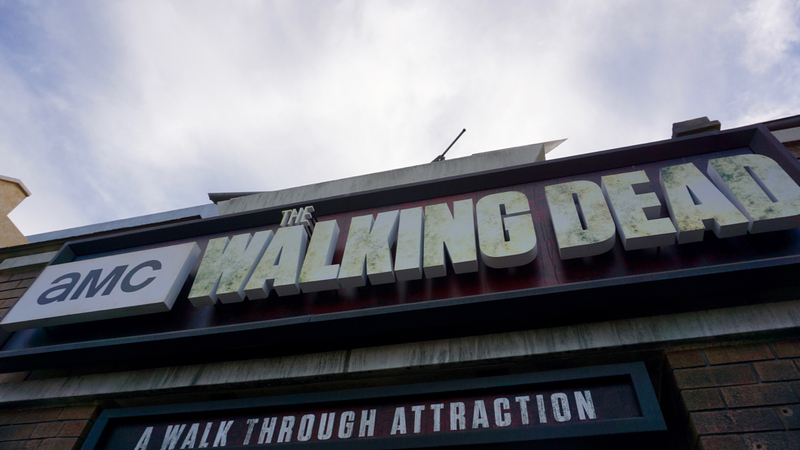 Along the way we stumbled upon the new Walking Dead attraction. We were visiting the park just a few days before Halloween, so zombies were a fitting way to end the day. 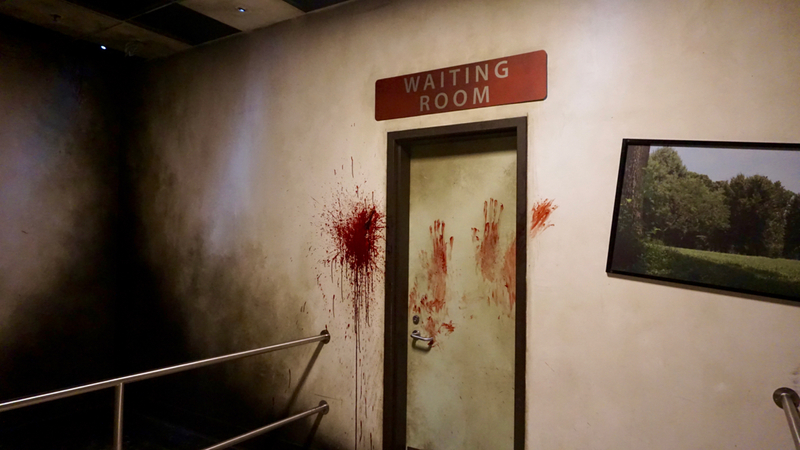 Once we waited through the line (most of which is inside the post-zombie apocalypse hospital where Rick wakes up), we were led through a dark maze of walkers. The walkers were all real people in costume and stage make-up and they played the part remarkably well. They would reach out at your face but would never touch you. 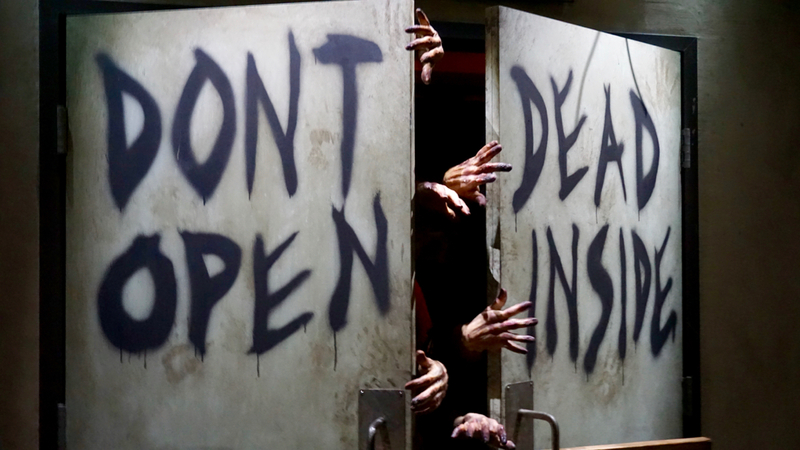 In fact, right before the tour the staff person tells you that the zombies will not really touch you and that you absolutely cannot touch them. I suspect a number of zombie cast members have scared people into a reactionary punch in the face. Right in front of us in line were two parents and their little girl. She looked maybe 7 years old. We were totally surprised that they were taking her through the maze. I would have been super freaked out by “real-life” zombies when I was seven. Even worse, the staff wouldn’t let her dad carry her through the maze. They said she could only go through if she walked herself. She was in tears by the end of it so strangers started coming up and giving her high-fives for going through the zombie maze, which seemed to help. 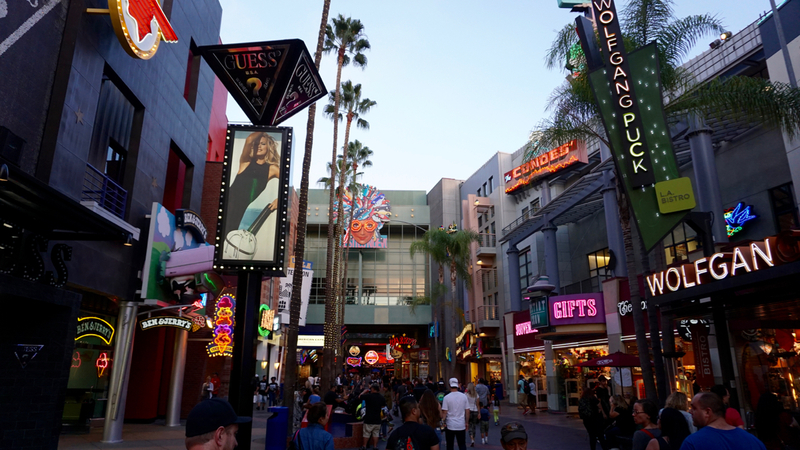 After our final day at Universal we stuck around to have dinner at City Walk, the strip of neon shopping centers and restaurants just outside the park. City Walk is open much later than the park, so it works well as a place to kill time waiting for traffic to die down. We walked the length of the strip and finally decided on a Sechuan Chinese place for dinner. We had some delicious spicy dumplings as a starter and I had an equally delicious bowl of udon noodle soup. Brandon ordered the house spicy chicken dish, which the waiter warned would literally make your mouth go numb. The plate was covered in more spicy chilies than I have ever seen in one dish. But it was a different type of heat. Your mouth felt numb instead of like it was on fire. It was strange, but actually pretty tasty. The best part was all of the other diners watching Brandon eat, like they were genuinely concerned for him. 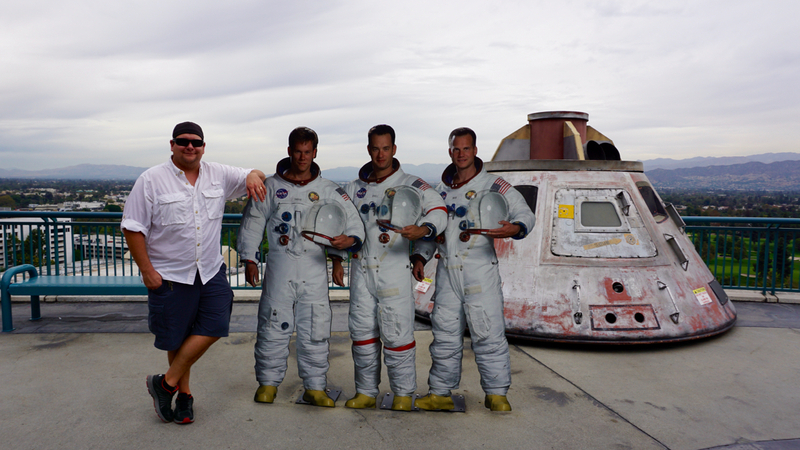 We had such a blast touring Universal Studios. After spending so much time out in the solitude of nature, sometimes it’s nice to escape to the city for some excitement, bright lights, and entertainment. But not for too long. To balance things out we’re spending the next few days enjoying the quiet isolation of a dry desert lake bed outside of Joshua Tree National Park. Previous Previous post: The Wizarding World of Harry Potter! What fun! Thanks for sharing. I bet Joshua Tree was a welcome relief after all the crowds and entertainment, but how cool it is that you got to experience all that. Love your wizard costume. Keep the magic going. Love you both.